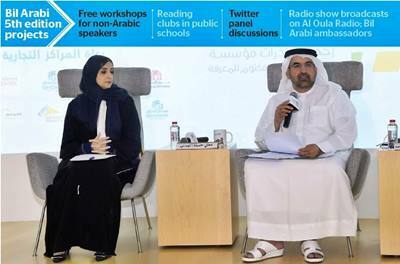 Jamal bin Huwaireb said the foundation will organise free Arabic language workshops, while Jameel Al Muhairi announced Bin Arabi reading clubs across public schools in the UAE. The Mohammed Bin Rashid Al Maktoum Foundation (MBRF) will provide free workshops to teach Arabic to foreigners as part of their Bil Arabi Initiative, it was announced on 13th of December. The foundation will organise Arabic language workshops for non-Arabic employees in the public and private sector, in collaboration with Qindeel Printing and Publishing, which will provide language material and specialists. Online short educational videos will also be posted through 'Bil Arabi' social media platforms to educate non-Arabic speakers about the basics of the language. Jamal bin Huwaireb, CEO of MBRF, said the Arabic language is the essence of UAE society and helps build bridges of positive communication with other cultures.In its fifth edition, the initiative will see many projects and activities until the year-end, to strengthen and preserve the use of Arabic among community members. It will see panel discussions posted to Twitter to address different topics, while also engaging social media users. Coinciding with UN Arabic Language Day observed on December 18, the 'Bil Arabi' initiative aims to encourage the youth to use their mother language across social media platforms and internet. In collaboration with the Ministry of Education, the foundation also announced the launch of 'Bil Arabi' reading clubs across the UAE's public schools to improve skills of students in different fields and extend the initiative's outreach among youngsters. Jameela Al Muhairi, Minister of State for Public Education, said the reading club will hone students' skills in reading, public speaking, story writing, art and poetry. The club will be located in public schools, but accessible to students from private schools across the country. "Students can choose the field they like and get access to material. We aren't talking about classrooms but refining students' skills to help them fulfil their passion in the future," said Al Muhairi, on the sidelines of a conference to announce details of the Bil Arabi initiative. She said the ministry has put indicators to measure students' comprehension of the Arabic language, ensuring they reached 90 per cent in their ability to read in Arabic. "Reaching this stage required plenty of effort, in collaboration with other government entities," said Al Muhairi, noting that reading tests revealed weak scores among students, who achieved 11 points higher this year. "We need to endorse the love of reading from a young age." From December 14-18, the foundation will install 10 interactive booths across malls in the UAE, to enable people take part in different activities and share their photos and videos online. Bin Huwaireb said the initiative has witnessed increasing participation across the years. Just last year, the hashtag #Bil_Arabi reached one billion users throughout the world on social media platforms including Facebook, Twitter and Instagram. "It shows young people love their language, but they don't see it as the language of education or the workplace. We are trying to change that by opening doors for them to show their support in preserving the language on social media," said Bin Huwaireb. Bil Arabi activities have also extended to other countries like Kuwait, Bahrain, Egypt, US, UK and North Korea, aiding the growth of Arabic content online and raising awareness on the importance of preserving the language. Users can access 'Bil Arabi' through bilarabi.mbrf on Facebook, bilarabi_mbrf on Twitter, Instagram and Youtube. Mohammed Bin Rashid Al Maktoum Foundation organises Arabic language workshops for non-Arabic employees in the public and private sector, in collaboration with Qindeel Printing and Publishing, which will provide language material and specialists. Online short educational videos will also be posted on 'Bil Arabi' social media platforms to educate non-Arabic speakers about the basics of the language.